The photo that launched a million tweets. Twitter may have helped Donald Trump get elected, but you can’t say that the microblogging service hasn’t done anything good for the world. Today, in what might be the internet hive mind’s most remarkable achievement, EW reports the Rihanna/Lupita Nyong’o team-up film that started as a meme is becoming a reality. 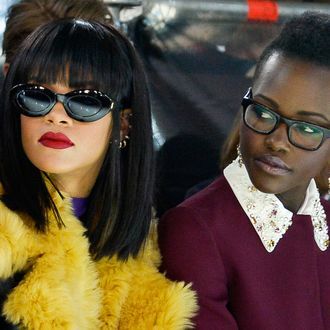 In April, a photo of Rihanna and Lupita Nyong’o sitting together at a Miu Miu fashion show went viral after Twitter user @1800SADGAL pointed out that it looked like a still from the world’s greatest buddy flick. Others on Twitter took the idea and ran with it, sharing ideas for the film and clamoring for Ava DuVernay and Issa Rae to join the project. Ultimately, the fan response was so effusive that all four women jumped onboard. @EW @rihanna @Lupita_Nyongo @ava So all of #BlackTwitter are receiving producer credit on this right?